The Birmingham City fan who attacked Jack Grealish has been sentenced to 14 weeks in prison and handed a 10-year ban from football matches. 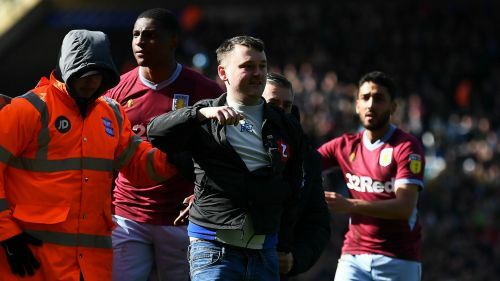 Paul Mitchell, of Rubery, Worcestershire, pleaded guilty to pitch invasion and assault after punching Aston Villa midfielder Grealish during the Second City derby at St Andrew's on Sunday. Mitchell, 27, was also ordered to pay £350 in fines and is prohibited from attending games in the United Kingdom for the next decade. The incident occurred just hours before a man ran across the field of play and pushed Manchester United defender Chris Smalling during their Premier League match against Arsenal at Emirates Stadium. "This weekend a line has been crossed in terms of fan behaviour," an FA spokesperson said in a statement.